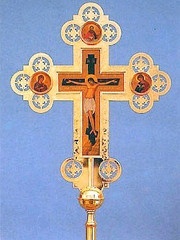 We are raising the funds for a Processional Cross for our mission parish. Our hope is to have it for Pascha, and to bless it for use in the Paschal procession this year. What a joy it would be for our community! The cross is $699.95 CAD (roughly the same in USD). You can check it out on http://shop.churchsupply.ca/collections/processional-items/products/processional-cross.